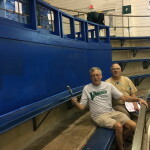 We can thank Jim Starrett ’74 and Wally Morton for spending a day to spiff up the TV Platform with a new coat of paint. How appropriate they choose December 28th – exactly two months before CSU Giving Tuesday ! Its ’bout impossible for a guest to walk into the viewing area without getting an eyeful of the platform. 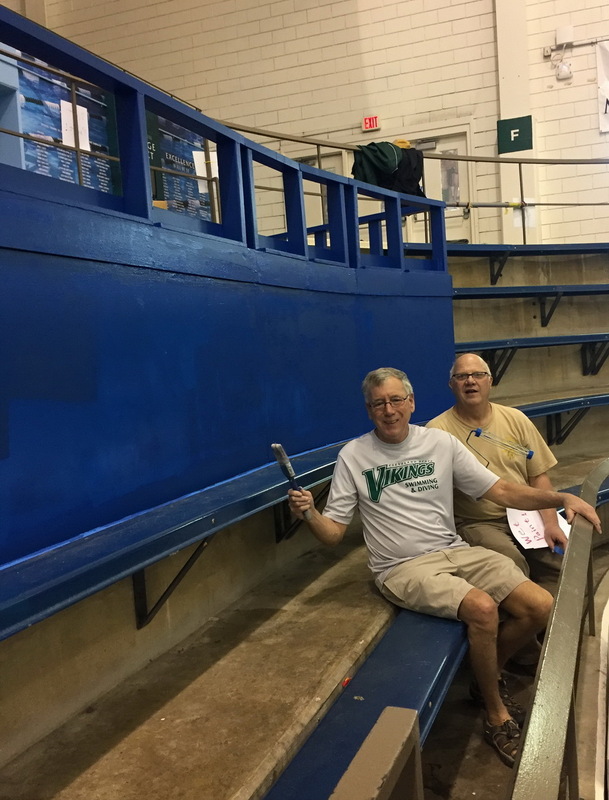 Finiahing this painting knocks off another item in the tuning up of the The Robert F. Busbey Natatorium. As you can see from the intro picture the platform sits just below the Heritage Corner in a visible line of site to the pool. Switching your field of view toward the NE corner of the pool the TV Platform is framed by new record boards to the north and timeline wall lined up above. So thanks again on behalf of our team – and Go Vikings ! The Heritage Corner is a key element of the Heritage Project, the final phase of the Champions Campaign. 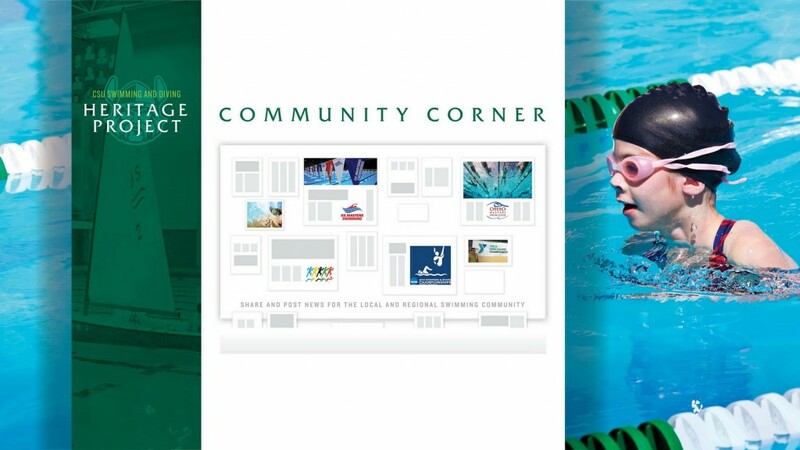 Thanks to advances in windows operating systems, we were able to create a website that provided information to friends and alumni during the final phase of the Champions Campaign, and then migrate that website onto a large wall-mounted PC that now serves as an interactive kiosk overlooking the pool. When first installed in 2015 the PC had access to the website, but was not really functioning reliably as a stand-alone, “bullet proof” kiosk. With the release of Windows 10 and its “kiosk mode” we had the technology to provide that capability. Enter Addison Kaufman’s father Kurt, whose background in IT and willingness to reconfigure the PC while in town for the Magnus Cup resulted in “Heritage Corner Kiosk 2.0”. WAY TO GO KURT ! 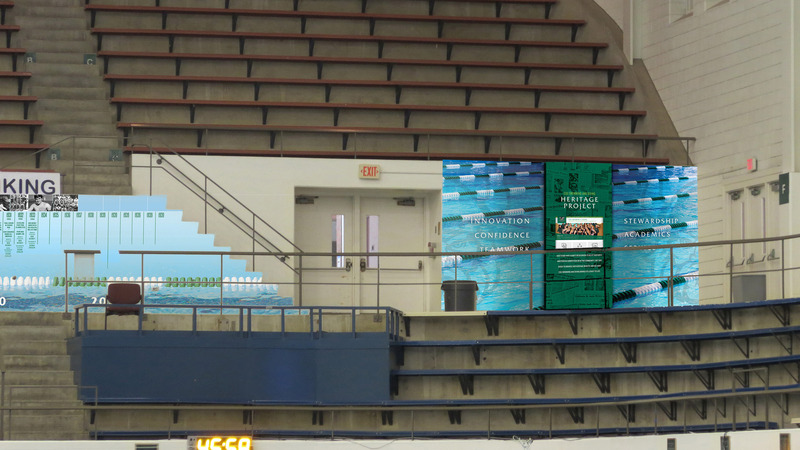 With the swimming & diving season upon us this kiosk will provide a visible and efficient way for parents, team members and visitors to share 9 decades of Fenn/CSU Swimming and Diving Heritage when in The Robert F. Busbey Natatorium. Push the power-on button – located on the lower right side of the PC. 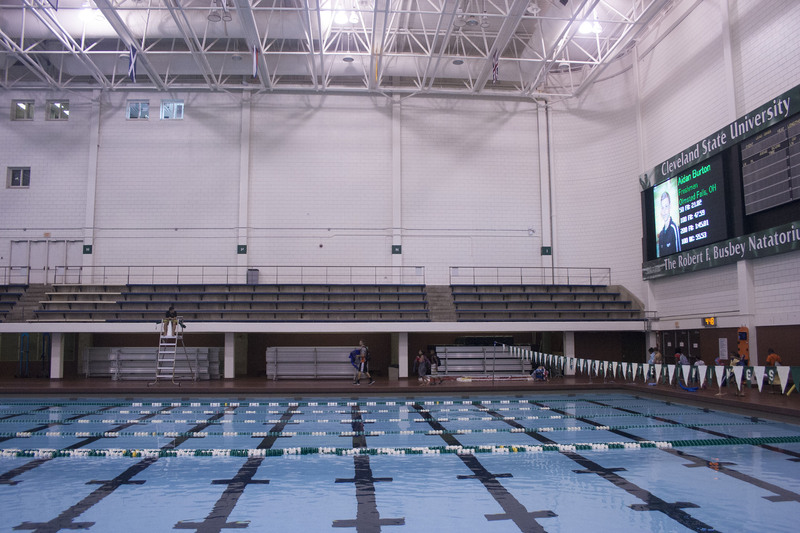 And speaking of the Magnus Cup, what a great sight to see bleachers and pool filled with swimmers, parents, friends and alumni for this fifth annual edition of the Magnus Cup held November 18-20. You can read all about the results HERE. The CSU men won the Magnus Cup for the third consecutive season, posting 1,608.5 points. Senior Philipp Sikatzki broke the school record in the 200 IM, reset two pool records and notched NCAA ‘B’ cut times in four events. Sophomore Tommi Wolst broke the school record in the 200 backstroke and surpassed two NCAA ‘B’ standards. The CSU women finished fourth of 14 teams at the Magnus Cup with 800.5 points, their best finish at the meet since 2013. Sophomore Molly McNamara broke the school record in the 100 fly, with a ‘B’ standard, and also won the 200 fly. Junior Tobie Zeller won the 100 breaststroke. Follow the team after the holidays – the schedule is HERE. 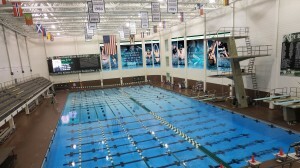 The Champions Campaign provided the funds to upgrade the record boards, add championship banners and install a new video board. You can listen to a 1-minute Thank You video and see the results here: Champions Campaign Thank You Video. 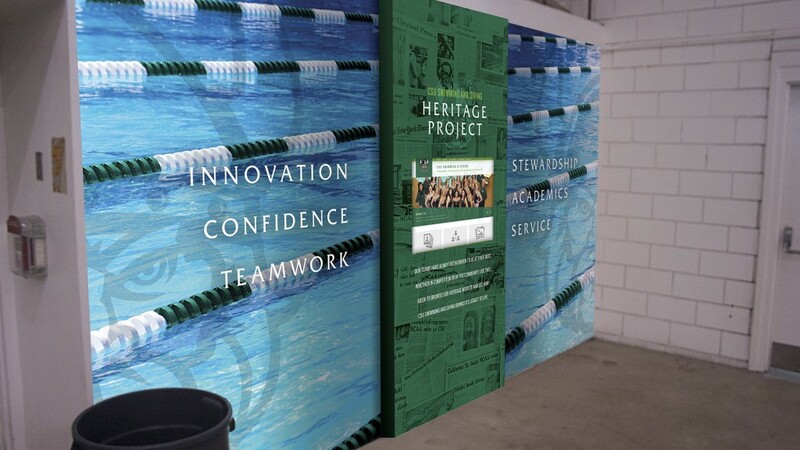 The Heritage Project will complete the Champions Campaign by adding eye catching and emotional graphics to the Robert F. Busbey Natatorium and will feature our team’s heritage, alumni, coaches, community, history and more. Everyone who passes by, peeks in, visits or swims in the pool should leave with a feeling of “wow” ! 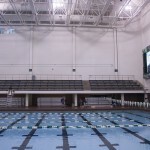 Alumni, especially, who see the timeline, heritage corner or Ninth Lane pictures up close should leave with a little bit of a lump in their throat or a tug at their heart as they emotionally re-connect with teammates, coaches and events and the opportunities that in some way developed because of their time with the CSU Swimming and Diving Team. 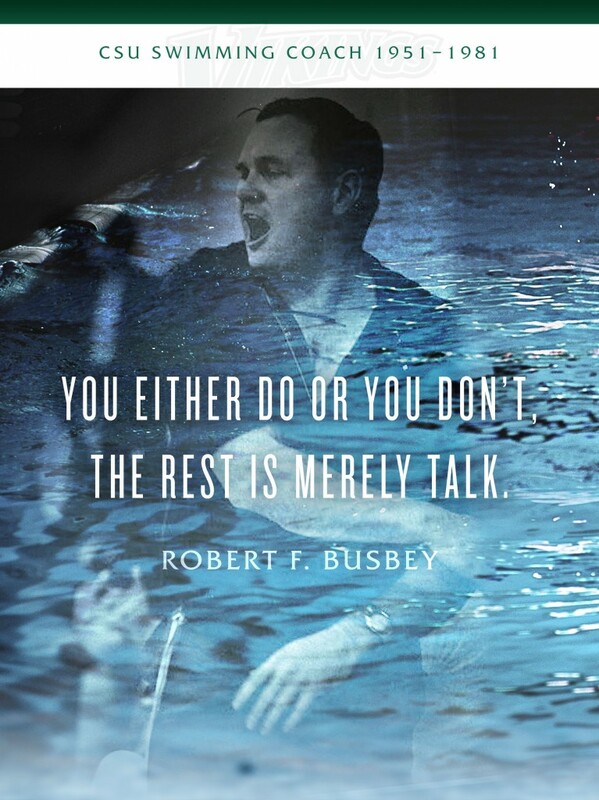 The concept graphics below are based on feedback from swimmers and divers, both men and women, who were connected with Bob Busbey and Wally Morton over the last 50 years. The Heritage Team looks forward to feedback from CSU swimming and diving alumni, coaches, current team members and friends as these images are refined during the final design, fabrication and installation phases of the Heritage Project – the third and final phase of the Champions Campaign. You can download a .pdf file for a higher quality view here: Heritage Concept Graphics with Descriptions (11MB .pdf file). Or you can view the descriptions and images below. 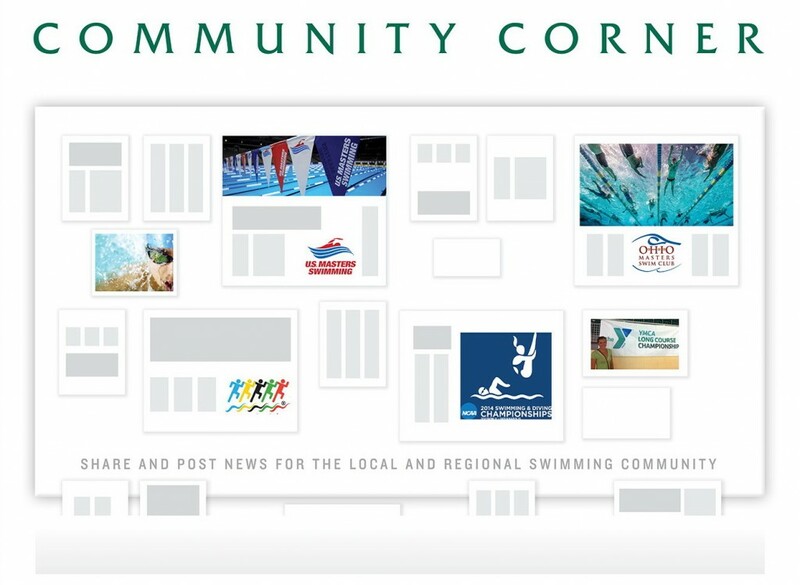 THE NINTH LANE – on the south wall opposite the rec center – will feature large graphics visible from the rec center or pool deck. 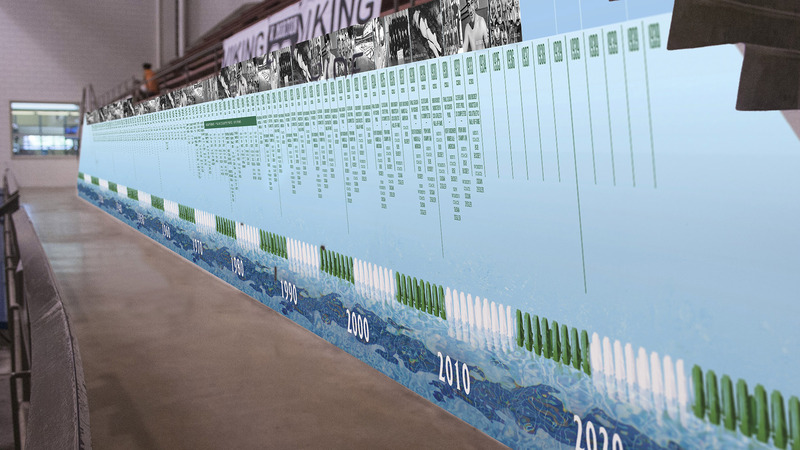 Pictures of teams, alumni, coaches and events since 1932 will be visible when viewed up close because of the “mosaic-like” graphics on the lower portion of the panels. When viewed from up close, observers will see individual pictures. This is the view of the Ninth Lane from the Rec Center or pool deck near the north wall. This is a rendering of the view from the top of the south bleachers. BANNERS – on the west and north walls – will feature large scale graphics visible from the bleachers, pool decks and from the south wall windows. 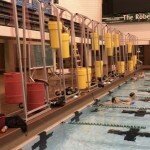 These graphics will honor Bob Busbey and Wally Morton and will add excitement and color to the pool. These banners, heavy vinyl or light-weight cloth, could be mounted to the walls or on stand-offs to add a sense of motion to the graphics. The concept would be to utilize a range of action shots on either side of Bob and Wally. 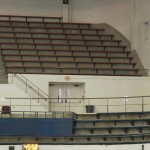 From the south bleachers it would look like this. This is a view from the pool deck on the north side of the pool. TIMELINE – at the base of the east bleachers – will feature people and events in the history of the program from 1932 through 2039. They will capture key events since the first Fenn team and continue through the 75th anniversary of Cleveland State University in 2039. 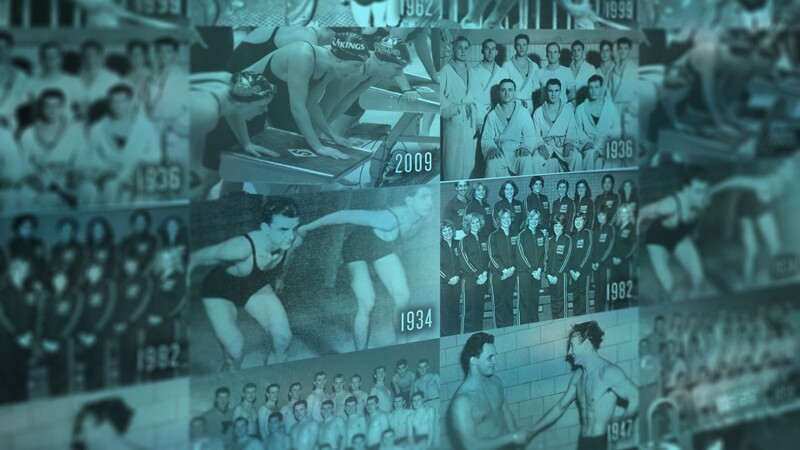 Many additional dates, people and events will be available on the CSU Swimming and Diving Heritage Website. 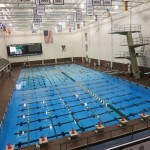 – www.csuvikings-swim-dive-heritage.com. The timeline would extend from 1932 through 2039-the date picked because it is 25 years from the launch of the Heritage Website and will coincide with the CSU 75th anniversary. These concept drawing sere created to share the vision of the timeline. The events shown on the detailed mockup below are simply to show size and scale – just placeholders for now. THE HERITAGE COMMITTEE NEEDS YOUR HELP- we’re looking for historically correct inputs and suggestions for entries on the time line. For example, we wouldn’t repeat coaches names each year, just their first year as head coach. The “milestones” below were taken from media guides, photo albums and other records. 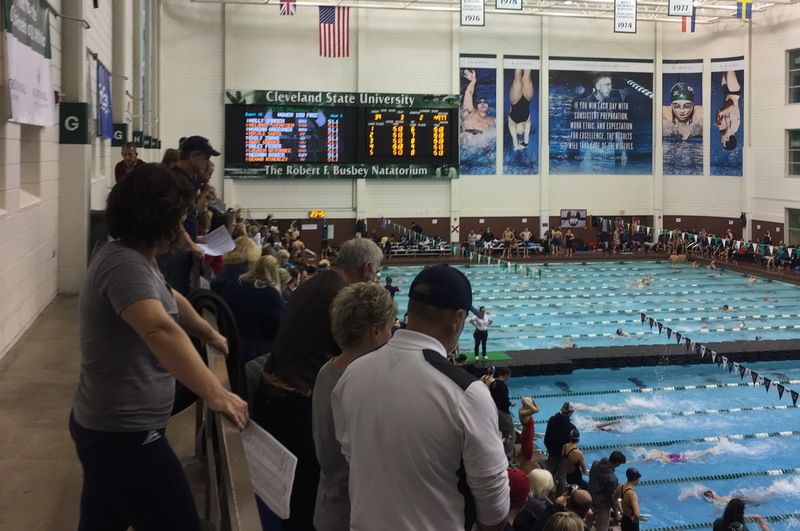 YOU can make a difference in what gets posted to the wall; just send your corrections or additions to heritage@csu-swimming-diving.com. Here is a view of the timeline from the foot of the eastern bleachers. COMMUNITY CORNER – located on the north end of the east bleachers – will be visible from the rec center as well as the south bleachers. 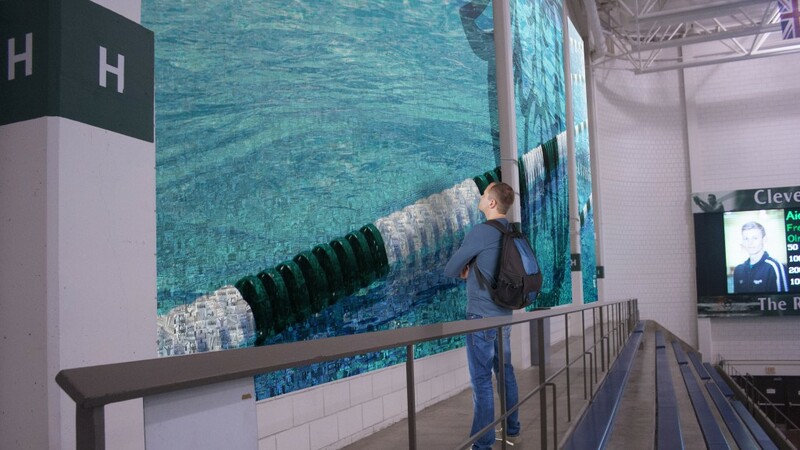 These graphics will capture community involvement in the pool and will focus on the many local, regional and international groups who have used and made history in The Robert F. Busbey Natatorium. The concept below is one option being considered for the Community Corner. When initially designed and installed, we will leave some space for additional entries. Other options might include an actual bulletin board as part of the corner. 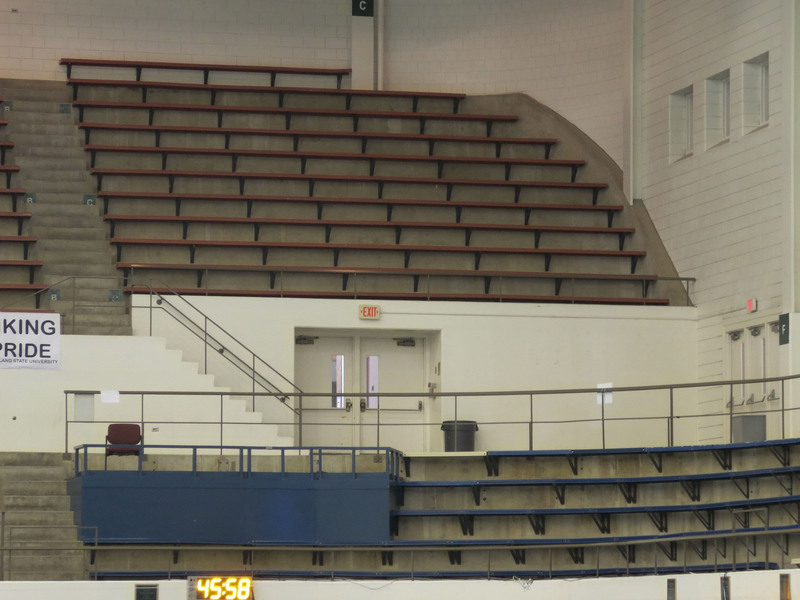 This is the view of the Community Corner from the south bleachers. 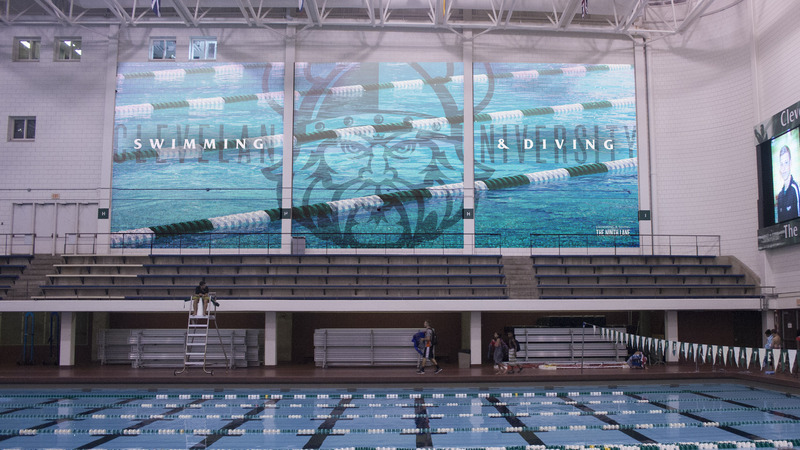 Note the watchful eye of Magnus between the two new Record Boards and visibility from the Rec Center. HERITAGE CORNER – located on north east corner of the second floor of the pool between the two main entrances – will be the home of a large kiosk. The attention-getting graphics housing the computer running an interactive touch-sensitive screen will honor the Program’s heritage. A second kiosk will be located in the hallway and will be mounted on the bulletin board next to the ticket window. From the western end of the pool the Heritage Corner will appear as a boundary for the Timeline, offsetting the Community Corner on the north. Notice the 3-dimensional raised panel over the touch-enabled screen in this view from the south east corner of the pool just inside the “tunnel” entrance. This panel, approximately 6″-8″ deep and 4′ wide, provides both dimensionality and security. Here is view of the Community Corner, Timeline and Heritage Corner viewed from the western pool deck. 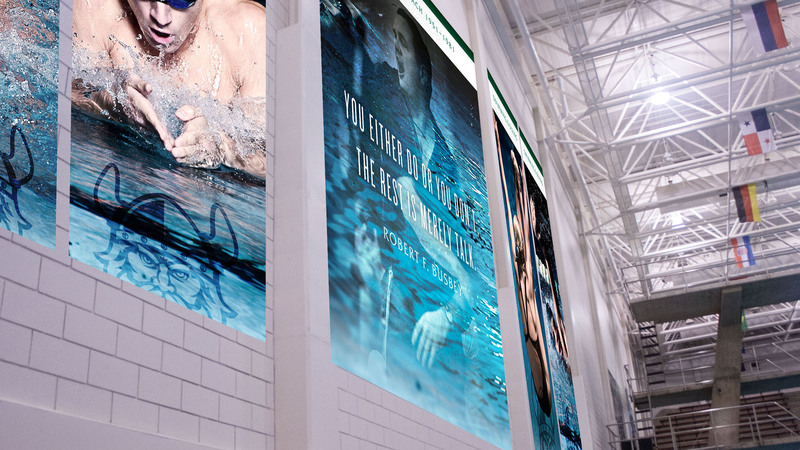 ADDITIONAL GRAPHICS will be developed for the men’s and women’s locker room, door wraps, graphics for the “tunnel” and other areas in and around the pool deck. Check out the concepts for the Tunnel Entrance to the pool – and let us know YOUR preference: Bright Blue or Dark Cool ? 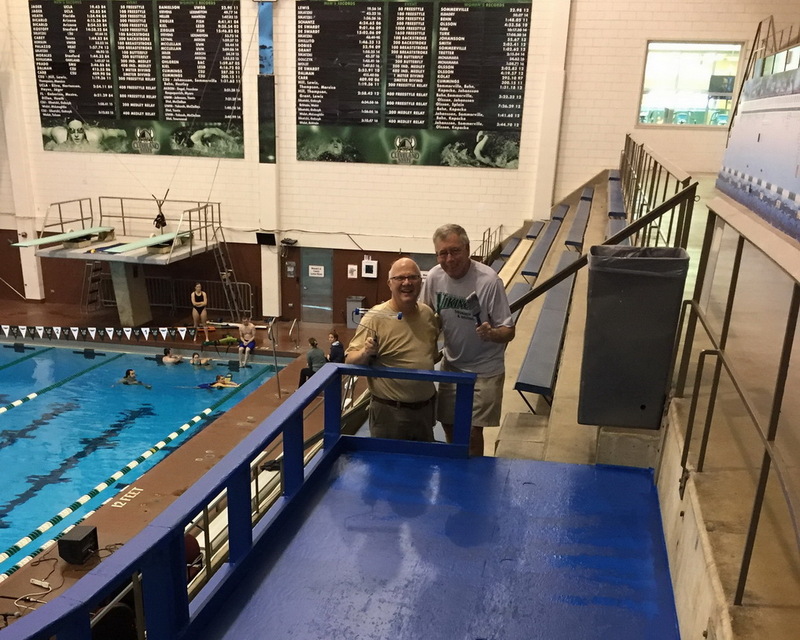 A very successful outing was hosted by Tom Smolinski’s lifelong friend Rob Hanlon for “The Cleveland State University Tom Smolinski Endowed Diving Scholarship” on August 15, 2016. The Event took place at the Buffalo Bison Coca Cola Baseball Field as the AAA Bisons took on the Red Wings. Activities included a Reverse Raffle, Silent Auction and plenty of delicious food and drink. 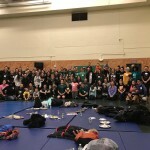 Over 70 people attended included Kim, her daughters, Tom’s parents, CSU Head Coach Paul Graham, CSU Diving Coach Rich Karban, former Coach Wally Morton, and so many of those who loved Tom. 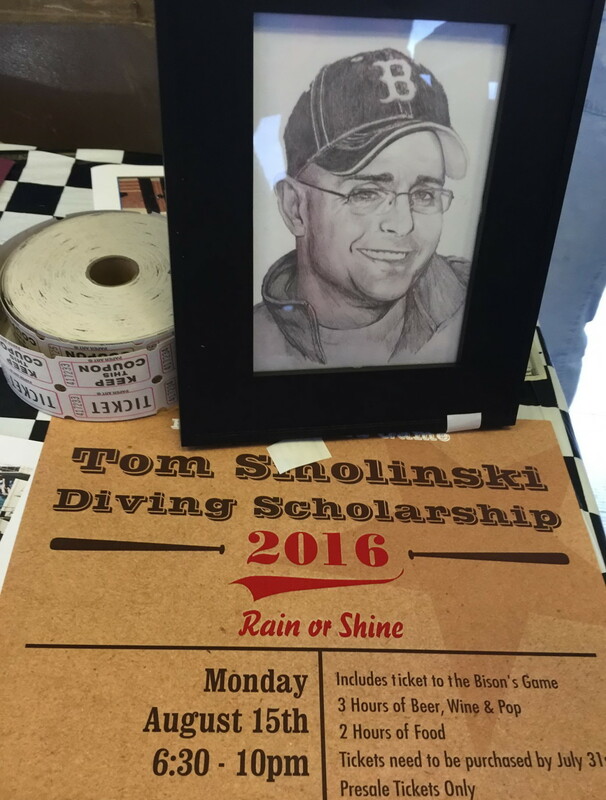 The Buffalo Bison Baseball Outing was an event organized to honor Tom’s Legacy and continue to grow the Cleveland State University Diving Scholarship in his name. CSU is honoring Tom by awarding two scholarships in his name for the 2016-17 school year. The recipients will be announced at the beginning of the season at the annual Splash Bash on October 1, 2016. The Event was a spectacular success with over $6,000 being raised for the Tom Smolinski Endowment. 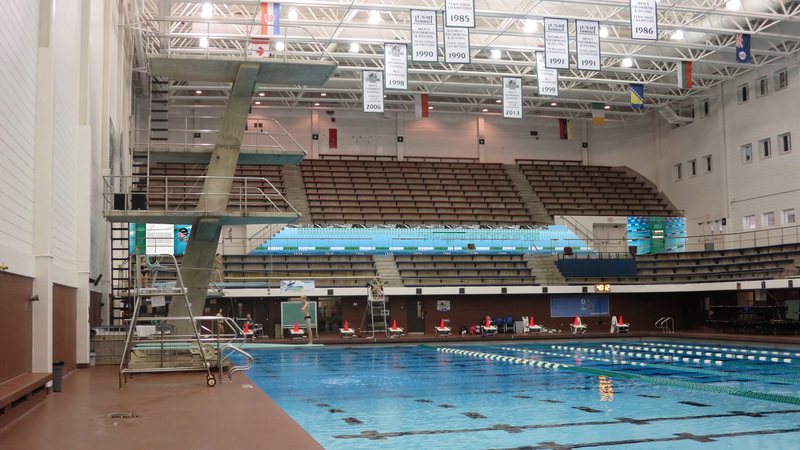 The Endowment continues to grow as we honor the life of Tom who was one of CSU’s greatest divers. Kim and the entire Smolinski family along with the community of Buffalo have made a real difference in people’s lives as others will have the opportunity to receive a degree at CSU and participate in the sport of diving. In case you missed the results of the Highly Successful Giving day 2016 – AND the men and women’s teams’ performances at the Horizon League Championship – you can read the February 28th email sent to friends and alumni HERE. Hope to see you at the annual Splash Bash fundraiser – Saturday, Oct 1st at The Robert F. Busbey Natatorium. Other CSU Homecoming events are here. 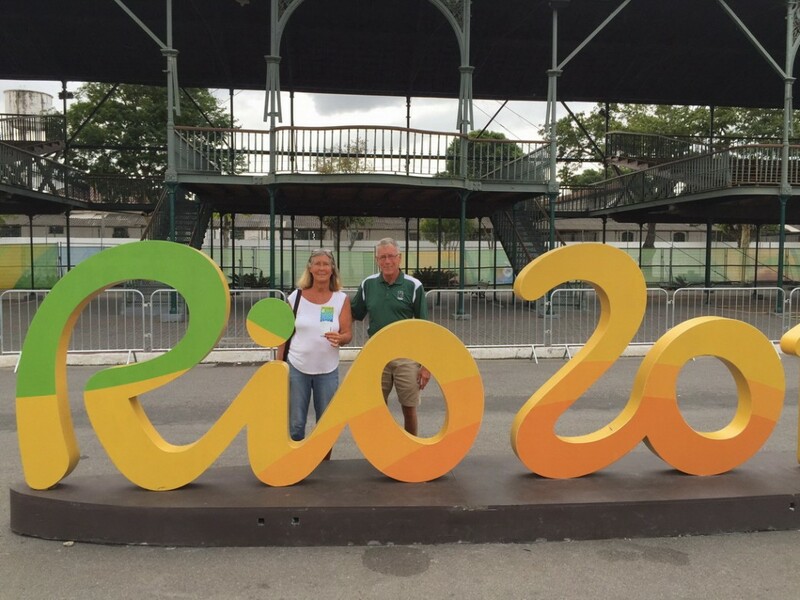 Carol and I had the opportunity to recently attend our tenth summer Olympic Games in Rio. The City of Rio de Janeiro should be commended for being the host for the biggest and best event that is on a magnitude unequalled in sports or any other enterprise. Despite monumental challenges along with negative media scrutiny they were magnificent. Everything about our experience was perfect. The people were welcoming; the mass transportation was efficient and comfortable; the venues are in beautiful settings surrounded by mountains and sea; and everything was on time. What attracts us to the Olympics is that it brings people from all over the world to celebrate in a peaceful way. We always love the culture of the host city and Rio was extraordinary. CSU has a long history with the Olympics. It’s greatest Olympian was Bob Busbey, who was one of only four USA Swim Coaches in the 1964 Tokyo Olympics. Swimming is the strongest USA Sport in the Olympic Games and starts immediately after the Opening Day Ceremony. The USA Swimmers had an historic performance and exceeded all expectations. It created an energy that was contagious with all sports. CSU Athletes and Coaches have been numerous. The greatest performance was Matt Gaffori who won the Silver in Heavy Weight Division of Greco Roman Wrestling in the 1996 Atlanta Olympics. Carol and I were there to see him wear his CSU Sweat Shirt as he ran around the Arena. 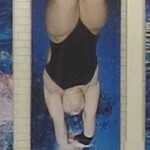 In swimming we have had many who have been part of our program that have participated in the Olympics. Another Olympic connection is Thiago Lazarini who swam with us in early 2000’s. He is from San Palo, Brazil and works for Proctor & Gamble in Costa Rico. In 2008 Nedim Nisic became the first active Viking swimmer in the history of our program to qualify for the Olympics. 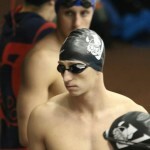 He was a Horizon League medal winner in the 100 fly as a sophomore and junior. 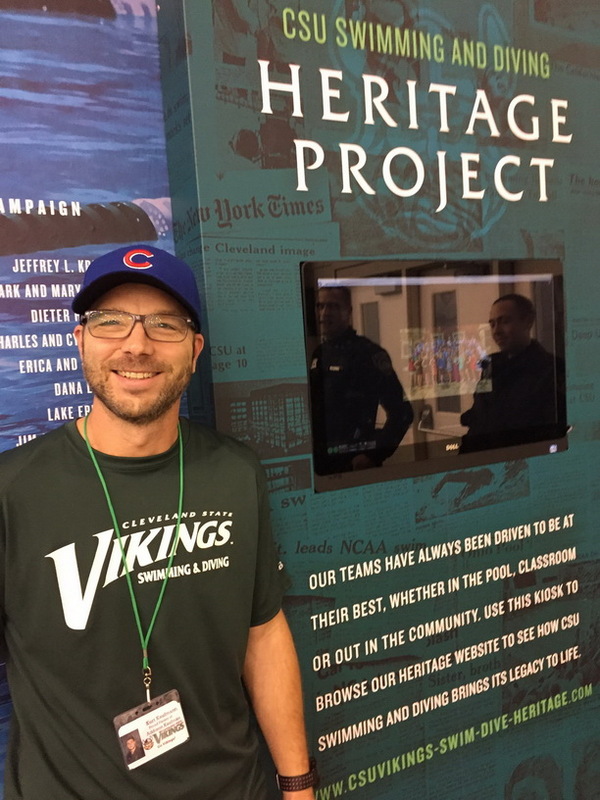 Nedim is vice-president at Aztek here in Cleveland and was instrumental in developing the CSU Swimming and Diving Heritage Website. Our journey this year was full of CSU connections. 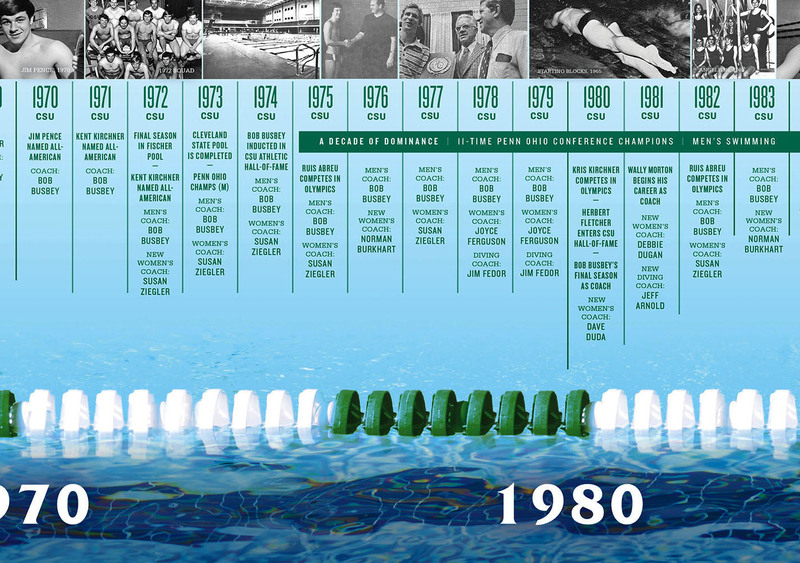 In 1983 the CSU Swimming & Diving Team traveled to Rio as part of an exchange program with Gamma Filho University. History professor Don Ramos established the relationship to strengthen ties with the two similar urban educational institutions. Everyone involved on our Team will never forget the amazing time we experienced in both clinics and competitions. Shortly after that Carol and I hosted two students from Gamma Filho shortly after our son was born. 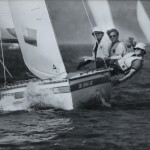 One was Cristina Santoni who went on to be a CSU Swimmer in the 1984-85 school year. The experience was life changing for her. After staying with us she moved into Fenn Tower and absolutely loved CSU! Her CSU/ Gama Filho University major was in Economics with an emphasis on accounting – a background that helped her a lot as she went on to be Senior Vice President of Chase Bank in Brazil. She has gone on to be a small business entrepreneur and among other things manages the Djan Madruga Sports Academy which is named for her husband who is a Olympic medalist in two sports and swam for the great Doc Councilman at Indiana University. Cristina was our host for the Olympics and we stayed at her apartment which was perfectly situated to ride the mass transit and easily get to any venue. She and her maid Lucy cooked all our meals. Her husband Djan was the swim commentary for Fox Sports. He was a torch relay participants and was on television the entire time we were there. 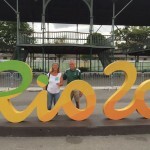 We attended opening ceremonies, gymnastics, slalom canoe/kayaking, cycling, beach volleyball, and of course swimming! At swimming we spent time with former swimmer Ian Murray who was an Olympic Coach for the Seychelles. His swimming insights and analysis were right on the mark! The USA fans were everywhere and made me feel pride for our country. The true Olympic spirit creates an atmosphere where you cheer for all the countries. We left the Rio Olympics a bit early to attend Amanda Pallija and Wesley Barnhart’s wedding in North Lawrence, Ohio. Carol and I love swimmer weddings and Amanda who graduated in 2014 is one of my favorites. (Everyone is my favorite) Swimmers both near and far from New Zealand, South Africa, Sweden attended. To Carol and me it was our embrace of all nations and what the Olympic Spirit is all about! What a way to conclude our Olympic experience!!!!! CSU Swimming and Diving is forever! Join me on #csugivingday on Wednesday Feb. 24. As we honor Tom and support the TEAM I love! When you participate on CSU Giving Day, you make the Swim-Dive Team strong! Tom was a great teammate,roommate, and most importantly, a great friend. He had an amazing quality of always having a positive attitude, which helped us overcome adversity during our college experience. Tom was very passionate about education, and his major in communications in particular. He was truly a student first, even with all of the time and energy spent with the Team that won back to back Conference Championships. Graduating from college meant a lot for Tom. We graduated together in 1999 and were roommates at the time – renting an apartment in Euclid together. I will always remember celebrating after receiving our Bachelor’s degrees! Tom was very excited about his internship with the Cleveland Plain Dealer newspaper in the Summer of 1998. While many of us struggled through our internships/summer jobs, Tom truly enjoyed his and was very passionate about his experience- I was jealous. I will never forget how excited Tom was about getting his college education and being a member of a Team that never lost a Conference Championship. Amazing! February 24th – EVERYBODY IN !! WOW! Another season is almost in the books. The older I get, the faster time goes. The season began way back in September with a roster of over 50 athletes. We welcomed 21 new swimmers and divers to the ways of the “Viking”. 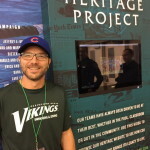 Early season was highlighted by the dedication of the Heritage project. All the great history that this shares with the team and public is truly amazing. The “Vikings” finished up the first part of the season with the Magnus Cup. This has been a great opportunity to peak as a team and see where we are at training wise in the season. There were many great performances highlighted by breaking two Busbey Natatorium records and four team records. Philipp Sikaztki broke the pool record of Pablo Morales in the 100 butterfly and the team of Sikatzki, Tommi Wolst, Szymon Golczyk and Robert Tolson took down the 400 medley relay record. Team records were recorded by Molly McNamara in the 200 butterfly, Szymon Golczyk in the 200 butterfly, Tommi Wolst in the 200 IM and the above mentioned 400 medley relay. In the classroom, we had thirty-six athletes achieve over a 3.0 grade point average and five that had a 4.0! The start of the second half of the season was very warm! The team was able to train in San Juan, Peurto Rico for a week and enjoyed perfect weather. Wally Morton and his wife, Carol, were there to ensure that the trip ran smoothly. The team trained great and has continued that with some very solid training and meets in January. As the calendar moves into February the team is eager show off all the hard work! 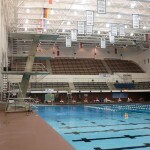 The Horizon League championship’s is being held at Oakland University. 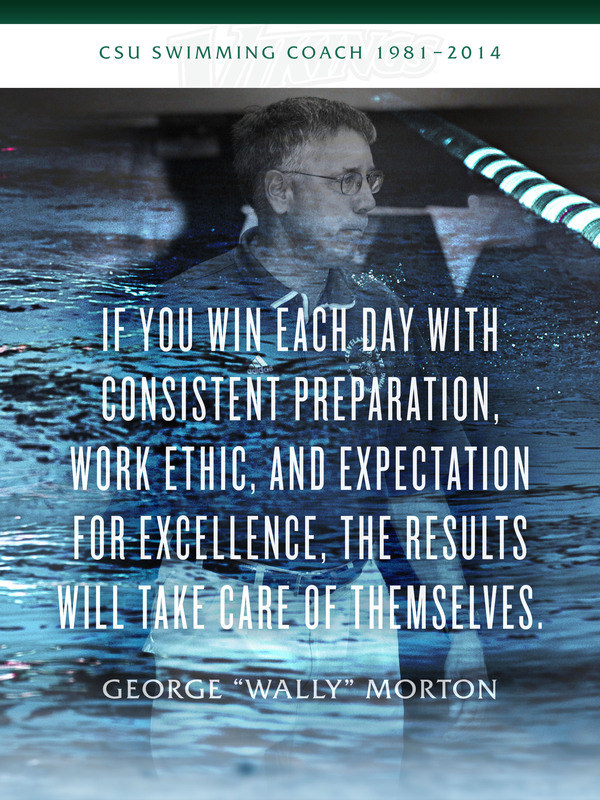 Both of the teams are eager to swim/dive the way they have been training and swimming at the meets…………FAST! One of the things we always discuss is the history; and all of the athletes that have helped get the Cleveland State University swimming and diving program where it is today. It is a topic we do not take lightly and are always working to make you proud of the current team. As we go through the process and build upon that legacy, we ask for your help. The annual CSU “Giving Day” is February 24th, which is also the first day of the Horizon league championships. 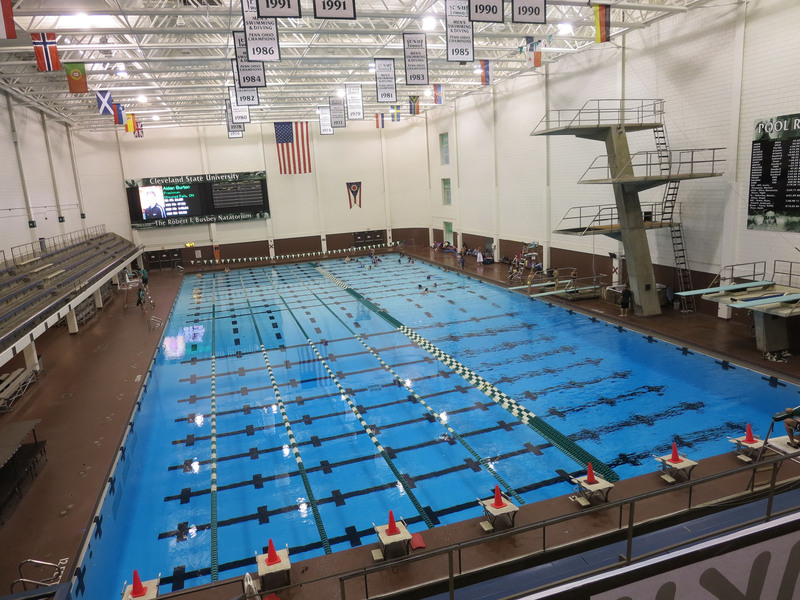 As the team strives to perform in the pool and on the diving boards, we ask you to step forward and show your support by giving to Cleveland State University swimming and diving! We are striving to be the best team in the Horizon league and we would LOVE to have the alumni to be the most active group on “Giving Day”! During our time at CSU, we were taught how to exhibit toughness and a will to win on a daily basis. No individual on this planet defined those qualities more than Tom! 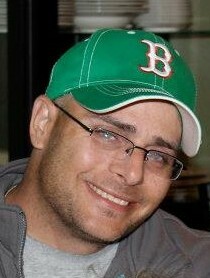 As a personal friend since our high school days in the Buffalo NY area, I wanted to share a quick memory of Tom. 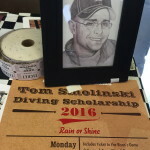 First off, Tom was a legend in the western New York diving community for several years. As such, when I got to know him, he was an established “star” who I was a little intimidated to meet. Our first meeting took place during a dual meet between our rival high schools. 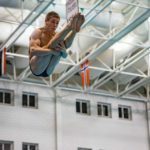 Up to this point in time, I did not appreciate what athleticism a diver could display and Tom was the first I had seen with his skill level. By the end of that first personal encounter I was Tom’s biggest fan. We immediately became good friends and ended up running in the same social circles for the rest of our high school days. At the end of our senior seasons, he and I had the good fortune to be roommates at the NY State swimming and diving championships. It was there that I got to truly see what a fun spirited kid Tom was. 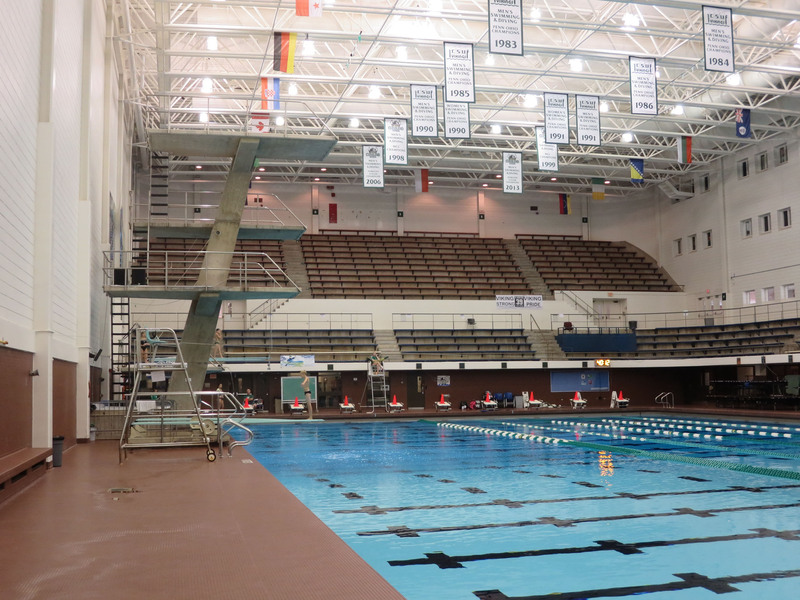 The University of Rochester pool deck lit up when Tom was on deck. 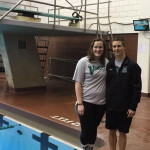 He had an amazing ability to connect with swimmers, divers and coaches from the entire state. It was no surprise that Tom was being heavily recruited by major NCAA division 1 programs. Unfortunately Tom had a little too much fun that last high school season and decided to focus on his studies at a local community college rather than continue his diving career. We continued to stay in touch when I went off to study and swim at CSU in the Fall of 1993. Tom went on to have a great career at CSU as a key part of two Conference Championship Teams! He was a winner in every way. 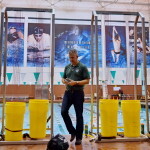 It was an honor to dive with Tom Smolinski at Cleveland State University. He was a great diver that kept us entertained and focused. We showed up every day because as a teammate Tom made it fun and pushed us to be our best. Diving practice with Tom was a thrill all by itself. If you weren’t holding your head from a near concussion, you were holding your gut from laughing so hard at one of his jokes or stunts that he contrived for the sole purpose of distracting us from physical and mental anguish. Most of us would have loved to end the daily beatings inherent with the sport, but Tom would keep us from self-imploding at practice. Tom Smolinski was someone that was always there to pick us up and make us laugh. He never let us quit, teaching us how to be resilient – which made many of life’s daily beatings a little more manageable.